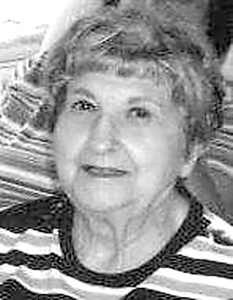 Mary D’Addese, 96, of Plainville, died peacefully at home on Jan. 22, 2019. Mary was born on July 13, 1922, in Montalto Marche, Italy, to the late Giovanna and Marcello Joseph D’Addese. Mary graduated from Plainville High School in 1940 and worked for many years as an executive secretary to the president of the Bristol Brass Corporation. She was a member of Our Lady of Mercy Church and the Plainville Senior Center. Mary enjoyed traveling and was an avid reader. She especially liked to cook and was considered a gourmet chef by many. She was noted for her baked stuff shrimp and lobster, mushrooms, cheesecake, and lemon pies. She is survived by her sister, Josephine D’Addese, and her brother, Anthony D’Addese and his wife, Frances; her nieces and nephews, Jacqueline D’Addese, Kathleen Joslyn, Joseph D’Addese and his wife, Yvonne, Jacqueline Dionne, Karen and her husband, Maurice Ouellette, and Stewart Schwab; her great-nieces and nephews, Krysten and her husband, James Robbins, Stephen Joslyn and his wife, Robyn, Sarah D’Addese, Jennifer Aquino, and Robbie Ouellette; her great-great nieces and nephews, Grady, Kinley, Ryleigh, and Landon; and her best friends, Edith Nelson and Katherine Fiorito. Mary was predeceased by her brother, Harry D’Addese and his wife, Margaret (Penny); her nieces, Susan Schwab and Camille Graziano; and her dear friends, Natalie Olashaw and Marion Collins. Special thanks to her caregiver, Maria Garzkowski of Euro Homecare, Lucille Levesque and Sal Penta of Hartford HomeCare, the staff of Touchpoints at Farmington, the staff of floor G at Bristol Hospital, Diane and Camille Albert, and the Plainville Police. Calling hours will be from 8:30 to 9:30 a.m. on Saturday, Feb. 2, 2019, at the Bailey Funeral Home, 48 Broad St., Plainville. Mass will follow at 10 a.m. at Our Lady of Mercy Church, 94 Broad St., Plainville. Burial will be in Saint Joseph Cemetery in Plainville. In lieu of flowers, the family asks that donations in memory of Mary be made to the St. Jude Children’s Research Hospital, 501 St. Jude Place, Memphis, TN 38105. For more information or to leave online expressions of sympathy, please visit www.BAILEY-FUNERALHOME.com . Posted in New Britain Herald, on Tuesday, 29 January 2019 13:23. Updated: Tuesday, 29 January 2019 13:25.